An Iraqi man holds an edition of Iraqi daily newspaper Azzaman displaying pictures of US presidential candidates Donald Trump and Hillary Clinton in Baghdad, Nov. 9, 2016. In Irbil, the capital of Iraqi Kurdistan, politicians say they could get no access to the Trump campaign to try to work out what his thoughts are on Kurdistan independence or how the war against the Islamic State terror group would change. “What is Trump’s secret, foolproof plan to beat Daesh militants?” asked a senior official with close links to Kurdistan Regional Government President Masoud Barzani. “He says the Islamic State’s days would be numbered, but they are anyway, we are making good progress in the campaign to defeat Daesh. What would he alter?” he added, using the Arab acronym for IS. While Trump hasn’t specified what he would do in Iraq, he has spoken frequently about working more closely with the Kurds, and for Irbil those remarks are a source of some comfort. 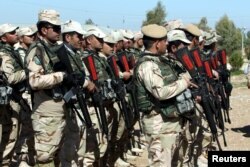 FILE - Kurdish Peshmerga fighters take part during a training session by coalition forces in a training camp in Irbil, north of Iraq, March 9, 2016. There is a guessing game going on in Iraq about the meaning of Trump. Some regional Arab politicians have found encouragement from a promise he made in February to be “sort of a neutral guy” on the Israeli-Palestinian conflict, a remark that alarmed Israel and many American Jews. 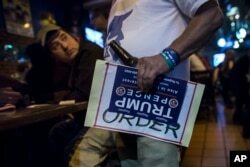 An Israeli man holds a sign of U.S. presidential candidate Republican Donald Trump as he watches a live update with friends of the U.S. presidential election results at Mike's place bar in Jerusalem, Wednesday Nov. 9, 2016. But in March he said that as president he would move the U.S. Embassy from Tel Aviv to Jerusalem, something that would delight Israeli leader Benjamin Netanyahu. More recently top Trump aides told The Times of Israel he doesn't see a two-state solution as a priority and he would pursue warmer relations with Tel Aviv, following eight difficult years in U.S.-Israel relations under President Barack Obama. 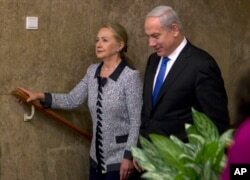 FILE - Israel's Prime Minister Benjamin Netanyahu walks with U.S. Secretary of State Hillary Rodham Clinton upon her arrival to their meeting in Jerusalem, Nov. 20, 2012. But his inconsistent campaign speeches and off-the-cuff remarks have prompted nervous head-scratching and bewilderment. Hillary Clinton was a known figure. She had a known foreign policy team and the people she would have likely appointed to key jobs at the State Department would have come from the “old familiars,” as an adviser to the Saudi royal family put it. There’s nothing familiar about the property mogul and celebrity TV personality when it comes to foreign policy and national security. He didn't have an established foreign-policy team during the campaign and most of the "old familiars" in the Republican foreign-policy establishment shied away or openly opposed him. 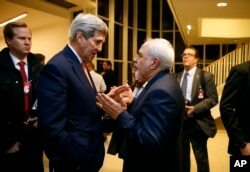 FILE - Secretary of State John Kerry talks with Iranian Foreign Minister Mohammad Javad Zarif in Vienna, after the International Atomic Energy Agency (IAEA) verified that Iran has met all conditions under the nuclear deal. 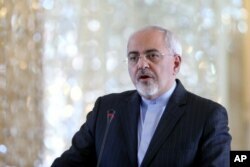 In reaction to Trump’s win, Iranian foreign minister Mohammad Javad Zarif, who is visiting Romania, said, “The U.S. president must fully understand the realities of today’s world. FILE - Iranian Foreign Minister Mohammad Javad Zarif speaks during a press conference with his Danish counterpart Kristian Jensen after their talks in Tehran, Iran, Monday, Jan. 4, 2016. All governments in the region were quick Wednesday to congratulate President-elect Trump and to start maneuvering quickly to get access to advisers around him. Ankara was among the first to offer congratulations. It took the opportunity to press for the extradition of the U.S.-based exiled cleric, Fethullah Gulen, who it accuses of masterminding the failed coup attempt of July 15. Syrian rebels who have been battling to oust President Bashar al-Assad for nearly six years, appear among the most anxious about what a Trump presidency might entail. Trump has said although he didn’t like the Assad regime, he would side with it and its patron Russia in the battle against IS.